I'm not so much wordless, as I am speechless. I mean... wow. I made them. And they are perfect and adorable! Nice job, Mom! Oh and they are just so gorgeous!! I love how you put it! you oughta be proud - look at those cute chops!!! Good morning sistas! It's one day until Friday! I'm sponsoring a Mardi Gras contest on my blog. Lots of fun cupcake prizes. Grand Prize: Juicy Couture Pink Cupcake necklace. Zen Cupcake February 17, 2009: Mardi Gras Giveaway! adorable, look at that hair too. :) My kids never stayed that blonde. Happy WW! Gorgeous! And Kudos to stores that have double seating in the carts! Those are two very handsome young men. Good thing you don't live in TX (or do you?) between your boys and my boys, there would be a lot of heartbroken texan belles. I actually miss those days! 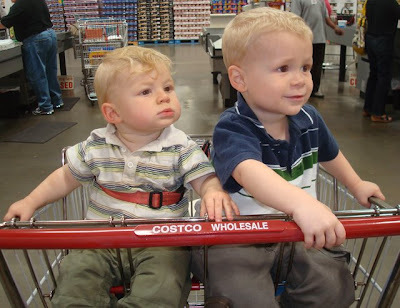 Mine are 7 and 9 - too big to sit in the shopping cart, so they walk next to me. Oh my goodness- so sweet!